All great engineering breakthroughs are borne of persistence. By that measure, Mazda’s dogged pursuit of the rotary engine — a compact, powerful, and exceedingly simple alternative to spinning camshafts, flying pistons, and cranking crankshafts — should win the global all-time award for persistence in automotive engineering. It’s enjoyed almost half a century of tantalizing advancement, with yet another looming on the horizon, evidently. So what gives? Why doesn’t Mazda throw in the towel and just start plugging electric motors into its cars like everyone else? The answer isn’t stubbornness — it’s conviction. Conviction that the rotary engine, once honed to perfection, still has a bright future as a critical contribution to automotive technology. After all, as much as electric motors are touted, that solution still has challenges of its own — charging speeds, range, weight, scalability, end use of recyclability — and internal combustion engines will remain essential for years to come. To find out why the rotary engine could make a big return sometime soon — it hasn’t been on sale since Mazda yanked the RX-8 in 2012 — let’s look at a few key factors: Its benefits, its fans, and its potential. A vintage photo of a triangular Mazda rotor. The team traveled from Japan to a firm in Germany, NSU, to look at one variation, the Wankel. Instead of pistons moving up and down, the Wankel uses unique triangular rotors that spin continuously in a single direction, spurred on by three injections of fuel on each side of the rotor with each complete rotation. The system generates significantly higher power-to-weight ratios, since the engines weigh one-third of that of similarly powerful piston engines. The engineers brought the design back to Japan, began ironing out bugs — including a problem with seals at the apexes of the rotor triangles that would cause premature wear — and developed dual-rotor production variants with NSU, the first of which appeared in the Cosmo Sport in 1967. The following year, the Cosmo 110S made its competition debut in the 84-hour Le Marathon de la Route at the Nürburgring, finishing fourth — and kickstarting Mazda’s love affair with racing. The renowned RX-7 roared to life in 1978, after the company worked tirelessly to reign in the engine’s fuel economy and emissions in the wake of that decade’s twin fuel and pollution crises. Along the way, the engineers still managed to boost power, taking the 982cc Cosmo Sport’s 110hp rotary to the 135 horsepower found in the RX-7's eventual 1.3-liter engine. The Mazda 787B, 1991 Le Mans winner. Throughout the 1970s, the engine developed a reputation among sports-car enthusiasts for simplicity and reliability — boasting just three moving parts per engine, the two rotors and the crankshaft — as well as smooth power delivery, thanks to the fact that there’s one power stroke for every revolution of the rotor, versus one combustion cycle in every two revolutions in a conventional piston engine. Furthermore, the smooth operation also reduced vibration — so much so that the manufacturer had to rig up an audible tone as the engine approached redline. It helped, of course, that the cars also succeeded on the racetrack, with RX-7 campaigns in the 24 Hours of Daytona (where rotary-powered engines delivered a total of 23 class wins for Mazda), the World Rally Championship, and the 24 Hours of Le Mans. (In 1991, in fact, a 700hp, four-rotor 787B prototype claimed the overall victory at Le Mans, marking the first and only time a Japanese manufacturer has won Le Mans, and the first and only time a non-piston engine won.) That momentum kept fans keen on the RX-7 throughout the ‘80s and ‘90s. Though the company faced rough times with a recession in Japan in 2002, and had to cease production of the RX-7, it bounced back quickly with the RX-8 just a year later, in 2003. That car featured a new RENESIS rotary engine, with improved emissions and fuel economy as well as a boost in power, to up to 238hp — and it continued finding success on racetracks around the world. Though details about the engine are as-yet unconfirmed, Mazda has promised that it will push power, efficiency, and emissions performance still further. 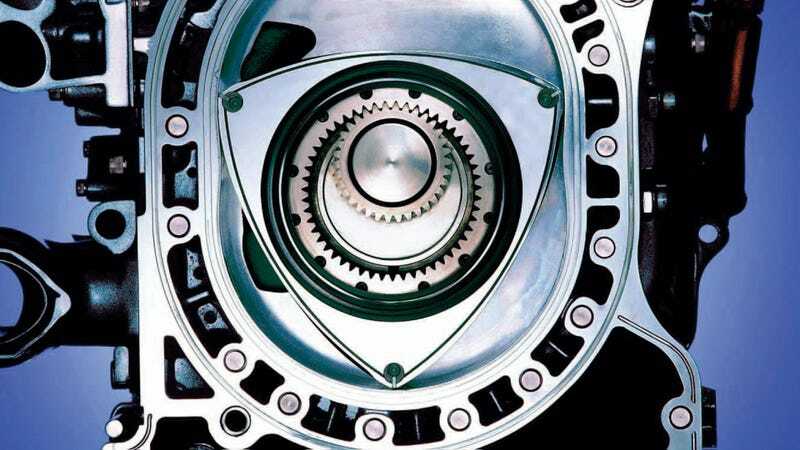 If recent history is any guide — via Mazda’s experiments in hydrogen-powered rotary engines and electric vehicles with rotaries used as range extenders — there could be any number of ways the next-generation Mazda rotary engine will manifest itself. If progress continues to play out as it has in the past, the engine will win over yet another generation of fans.